Deep Water Dance Festival is your type of festival if you like diving and dancing. You will be staying in a beautiful house located on a hill and living with the other festival participants. 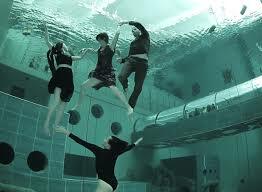 You will be dancing at Y-40 pool, which is the world’s deepest swimming pool. You need to be a certificated freediver to participate. “The goal of the meeting is to practice freediving, dance, contact improvisation, watsu, yoga, relaxation, video making … living together in the same house for four days and participating in all these collective research activities. Learn more about the Deep Water Dance Festival.